An autumn evening in 1937. A German engineer arrives at the Warsaw railway station. Tonight, he will be with his Polish mistress; tomorrow, at a workers' bar in the city's factory district, he will meet with the military attache from the French embassy. Information will be exchanged for money. 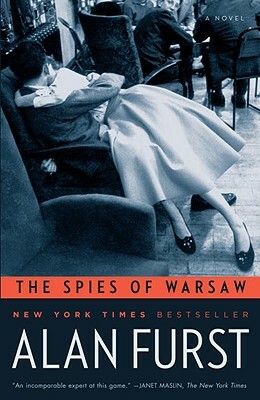 So begins The Spies of Warsaw, the brilliant new novel by Alan Furst, lauded by The New York Times as "America's preeminent spy novelist." War is coming to Europe. French and German intelligence operatives are locked in a life-and-death struggle on the espionage battlefield. At the French embassy, the new military attache, Colonel Jean-Francois Mercier, a decorated hero of the 1914 war, is drawn into a world of abduction, betrayal, and intrigue in the diplomatic salons and back alleys of Warsaw. At the same time, the handsome aristocrat finds himself in a passionate love affair with a Parisian woman of Polish heritage, a lawyer for the League of Nations. Colonel Mercier must work in the shadows, amid an extraordinary cast of venal and dangerous characters -- Colonel Anton Vyborg of Polish military intelligence; the mysterious and sophisticated Dr. Lapp, senior German Abwehr officer in Warsaw; Malka and Viktor Rozen, at work for the Russian secret service; and Mercier's brutal and vindictive opponent, Major August Voss of SS counterintelligence. And there are many more, some known to Mercier as spies, some never to be revealed.